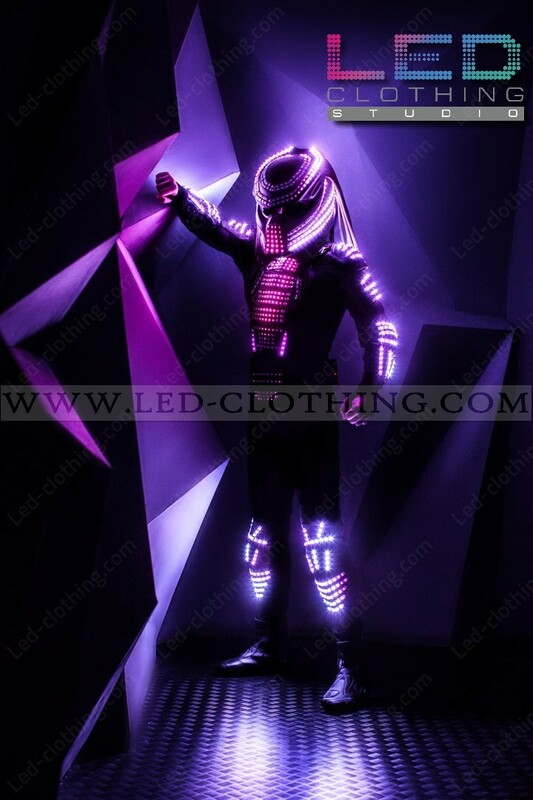 Predator Pixel LED Costume with wireless control | LED Clothing Studio Inc.
"There's something out there waiting for us.." Prey upon your success with our exclusive LED Predator suit, performed with an attention to details, inspiring awe to where you set your foot. The suit is operated by an independent controller which allows you to program quite a number of visual effects to make the most of your performance and capture your prey..! 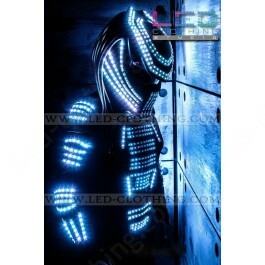 Predator Pixel LED outfit with more than 2500 digital leds and wireless control will blow up any party. Professional software for creating animation is included, wireless 5ghz receivers and transmitters are optional for additional payment. Proposed by us model consists of an elastic solid jumpsuit. It is suitable for guys and girls, and can stretch to different sizes. This is important if you purchase costumes for your employees. If the employee changed, the suit will be fit to another one. The costume is absolutely free and allows the artist to perform any dance and acrobatic movements. 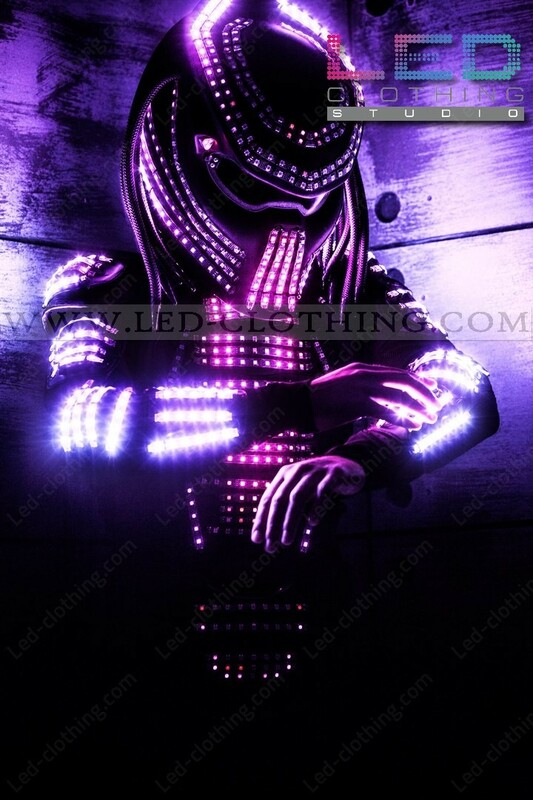 LEDs are located in high-impact waterproof capsule - it allows the artists to use the power movements on the floor or work with circus items. Suit can not work without control over the network WiFi. Special software for Windows computers (tablets) is used to control it. Power supply costumes can be performed either from the Li-pol battery or Ni-Mg batteries. For powering costumes used Ni-mg 1.2 volt batteries 2700 mA / h - 32 pieces (number of batteries depends on the number of LEDs and the amount of time required). Never use a conventional batteries - it will harm the product without possibility to repair! Rechargeable batteries have a significant weight and for this reason not included in the standard package. Li-pol batteries smaller in size but have a time limit operation. Required operating time can be set using the required number of batteries. They are much more expensive than ordinary batteries, but is easier to use. When ordering, using Li-pol battery, we include them in the package. We are a manufacturer of costumes - for this reason we can realize any of your ideas. This model contains 350 controlled LEDs. Number of LEDs and pattern can be changed according to your wishes. You can specify the time of continuous operation and the product, we will equip the necessary power supply. There are standard software solutions for this type of suits. We are not the authors of this software, but we are the official dealer. This program allows you to unleash the full potential of the technology “VIDEO-LED”! Ability to create any visual effects, management in real time, or sync with the soundtrack. Each effect can be configured in many ways, including using sound activated and tonal activation (when the effect can listen to music and adapt to her, example - EQ. In addition, this effect can be applied to the audio track and the time required to launch.) The computer connects to the costumes through WiFi. Software allows you to control 3200 LEDs or groups of LEDs. This program is needed to show groups with lots of artists. This program is suitable for managing all technology products “VIDEO-LED”.Extended license may be received by improving the base license. License is a USB flash drive and can not be copied. In all cases, the seller provides the necessary materials for training to work with software products. In addition the seller provides a series of video tutorials to create your own show and all the necessary consultations before the first performance with the finished show. Suits series "VIDEO-LED" consist of superbright LEDs. Each LED is soldered to quality aviation stranded wire, and placed in a shockproof waterproof shell. Ready chain attached to the suit using plastic clips. At the point of attachment - suit fabric stitched and duplicated in the form of a square, for extra strength and durability. Holes for clamps heat treated to prevent rupture of the suit fabric. Next hole is processed with a special metal rivet (If the order more simple execution not put metal rivets) - that reinforces edge of the hole and prevents rupture fabric base. 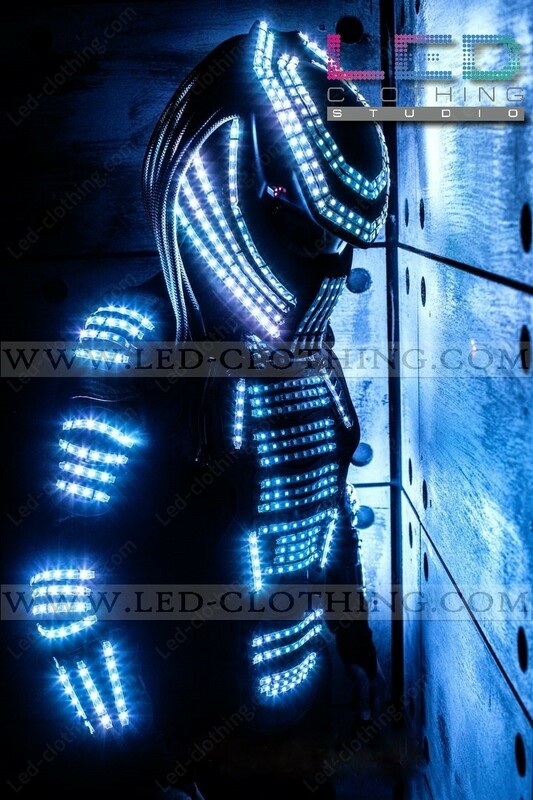 The suit has a special belt for mounting power supply and control of LEDs. The control system allows you to control every single LED. The controller has a connector for connection to the battery boxes, they supply controller, and it supplies the LEDs on the suit. LED chains are connected to a special connector on the controller connectors are numbered to avoid connection errors. To control the controller using a wireless router. It has an independent power supply and connected to the control board via Lan cable. Company manufacturer Wireless Router Tp-link (2,4 GHz) or Dlink (2,4 GHz and 5GHz). We produce the necessary software configuration to router for adapt to our control. Power supply with the controller placed in a special belt which has a backpack mount form Y for additional fixation on the body. This allows you to share the load on the back. The belt slim and not visible under a suit.